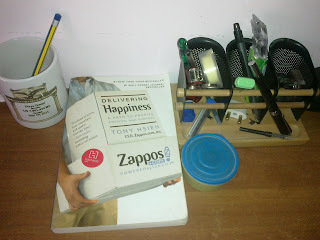 Last year i read a fantastic book - Delivering happiness. It is now in my frequent read list & adorns my desk. What makes DH different from most business books is that it deglamorizes businesses & CEOs. It’s a refreshing break from golf playing, cigar smoking, suited Jack Welch clones. Reading DH is more like reading a travel guide where the author is recounting what he learnt on the road trying to keep his head above water. Consistency is better than intensity. It’s ok to move slowly towards your goal. When Tony takes up running he asks marathoners their secret; they say when you start, run slowly. You should be able to breathe easily when you are running, initially your pace will be shockingly slow but over time, it will increase. It’s easy to overlook this lesson in our fast paced lives where delay is frowned upon and there is always another mountain to conquer. Invest in experiences rather than material pleasures. For e.g. you might desperately want a 42K iPhone but it’s better to invest that money in travelling. This is something I am looking forward to implement. It is difficult because we are always surrounded by advertising messages & unofficial brand ambassadors flaunting their latest purchases. What makes this even more tough is that it’s much easier to walk into a store & buy an iPhone than spending time & energy on travelling. In addition to these Zappos core values are a powerful message. My favorite core value is Pursue Growth & learning.